The next Latin Mass in Hull will be a Low Mass at the Church of St Charles at 6.30pm on Wednesday 7th October. The celebrant will be Fr Peter Mulholland. Following good coverage of the August Mass in the Hull Daily Mail and the Hull Journal, I am expecting a good turn out. 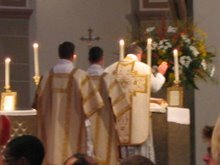 I have just looked at the listings provided by Coalition in Support of Ecclesia Dei for usus antiquior Masses in North America. The Coalition in Support of Ecclesia Dei is a sort of federation representing numerous (usually state based) societies campaigning for Latin Masses in North America. It covers both the USA and Canada. I found 416 Masses listed that took place every Sunday at a regular time. As this side of the Atlantic, there are many more Sunday Masses that take place on a limited number of Sundays (eg 1st and 3rd of the month). I prefer to discount these as unsatisfactory provision. The provision works out at just over two per diocese which is similar to England and Wales, but the variation between dioceses is much greater than it is here. In the US, there are several dioceses with no Latin Masses at all on Sundays, whilst New York has the best provision with 12. It is noticeable that provision in Canada is much less than in the US. Of course, there may be omissions in the Ecclesia Dei listings. 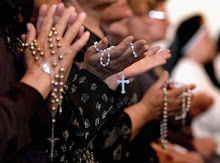 They have a much more difficult task collecting the information from 185 dioceses than the Latin Mass Society has from 22 in England and Wales. I do not have much interest in the game of Rugby, but a story on the website of Fr Ray Blake of St Mary Magdelen's Church in Brighton caught my eye. Apparently the whole of the Samoan Rugby team turned up for Mass in his church last Sunday. At the end of Mass, they sang a hymn in their own language. So, not only did they make a big visual impact, but they also made themselves heard using the powerful lungs that one might expect of rugby players. Go to Fr Blake's blog to see a recording. I understand that the current edition of the Hull Journal includes a feature about the Latin Mass in St Charles' Church in Hull. At our August Mass, which was a Missa Cantata, a reporter and a photographer were present and many photographs were taken. Although I have not seen the feature article, I am told that it is very impressive, with plenty of good photographs. Has anyone seen it? I have recently returned from the LMS's pilgrimage to Walsingham. About 80 people walked, or attempted to walk, the 55 miles from Ely to Walsingham. I should add that I was not among the walkers, but was involved with the logistics of the pilgrimage. For the final Mass at Walsingham, the walkers were joined by day pilgrims, who had travelled from various parts of the country, including a coach load from London. Amongst the walkers were three who had come specially from Perth in Australia and one who had travelled from the USA. There will be a Low Mass at St Charles' Church in Hull at 6.30pm on Wedneday 2nd September.